Sometimes the easiest way to spruce up a room is to add a well-placed accent piece. 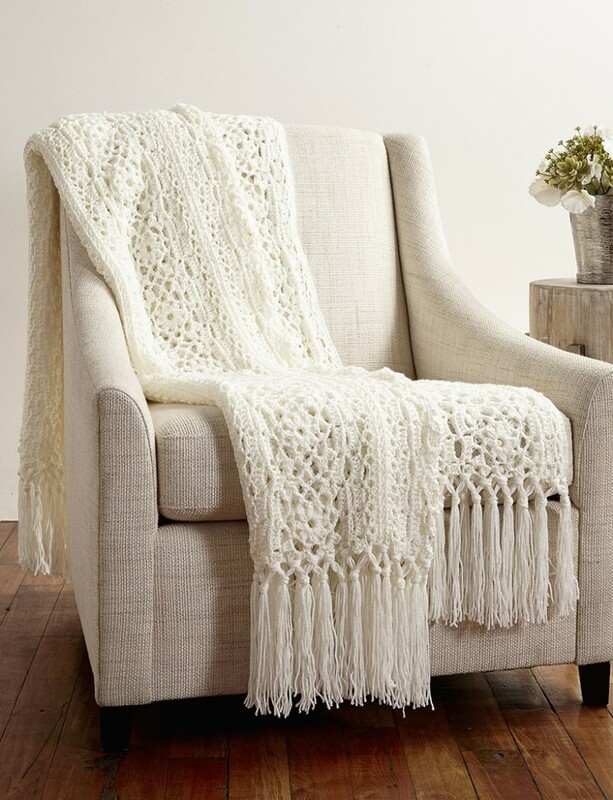 Something simple like a crochet afghan  can make all the difference in the world when displayed on a chair or couch in your living room. Today we’re bringing you a free afghan pattern  from Yarnspirations! 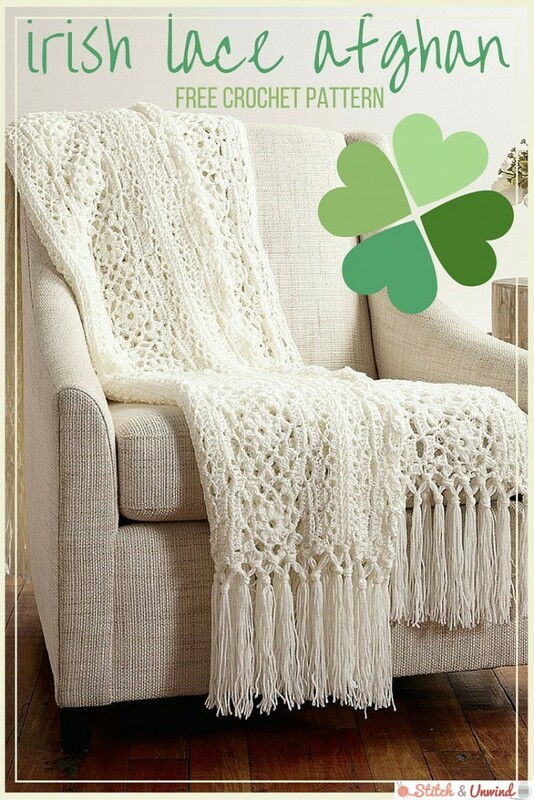 This gorgeous Irish Lace afghan adds a touch of elegance wherever it goes, and the clean white color is the perfect complement to any decor scheme! Enjoy this Free Pattern Friday, and have a fabulous weekend! Approx 56″ x 64″ [142 x 162 cm]. Excluding fringe. Motif = 4″ [10 cm] square. 1st rnd: Ch 2. (Yoh. Insert hook into ring. Yoh and draw up a loop. Yoh and draw through 2 loops) twice. Yoh and draw through all loops on hook- Dc2tog made. [Ch 3. (Yoh. Insert hook into ring. Yoh and draw up a loop. Yoh and draw through 2 loops) 3 times. Yoh and draw through all loops on hook- Dc3tog made] 7 times. Ch 3. Join with sl st to top of first dc2tog. 3rd rnd: *Ch 5. (Dc3tog. Ch 3. Dc3tog) in next arch. ** Ch 5. 1 sc in next arch. Rep from * twice more, then from * to ** once. Ch 5. Join with sl st in top of dc at end of 2nd rnd. Fasten off. 3rd rnd: (Join to previous Square). Ch 5. *(Dc3tog. Ch 1) in next arch. Insert hook from RS in center ch of corner of previous Square and sl st. (Ch 1. Dc3tog) in same arch. * **Ch 2. Insert hook from RS in center ch of ch-5 arch of previous Square and sl st. Ch 2. ** 1 sc in next arch. Rep from ** to ** once more, then from * to * once more. 2 Squares joined. [Ch 5. 1 sc in next arch. Ch 5. (Dc3tog. Ch 3. Dc3tog) in next arch] twice. Ch 5. Join with sl st in top of dc at end of 2nd rnd. Fasten off. Panel Edging: 1st row:(RS).Join yarn with sl st to any corner ch-3 sp of Square at end of Panel. Ch 3. 2 dc in same ch-3 sp. *(5 dc in next ch-5 arch) twice. 2 dc in corner arch. 1 dc between Squares (over joining st). 2 dc in next corner arch. Rep from * ending with 3 dc in last corner ch-3 sp. Turn. 5th row: Ch 2. 1 hdc in each st or ch to end of row. Fasten off.Work these 5 rows edging along other side of Panel. Cut 24″ [61 cm] lengths of yarn. Taking 3 strands tog, knot into first and last st. Taking 6 strands tog, knot into fringe evenly across end of Afghan. For second row of knots, take 3 strands from every section and knot tog. Trim fringe evenly. What do you do to change the look of a room?